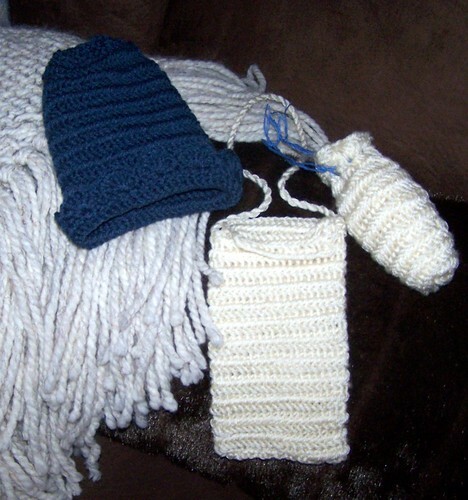 Posted on December 19, 2006	by Linda S.
I finished these 3 pouches using my oak needle and acrylic yarns. The blue is very stiff and while you can’t see it well in the photo, it shows the stitches very well. (Love that) The edging around it is crocheted and that was a surprising experiment. I wondered how the crocheting would work with the naalbinding, but it actually worked out quite well. This entry was posted in Handcraft, Handwork, Historical Textile, Naalbinding, Needlework. Bookmark the permalink.